#forevergushing / Photography by the fabulous StudioSomething. So… what else can we do? What will work for an evening exit? Over the course of the next two months, Mr Big and I deliberate what to do. A glow stick exit was proposed, but didn’t match our general wedding ‘theme’; bubbles don’t photograph well at night; and confetti is usually out of the question because of the mess factor (and I don’t really like confetti). The reception space usually has a goodbye circle or an archway, but a goodbye circle involves the bride and groom saying goodbye to EVERYONE (and we have over 100 guests) and the archway was used by my cousin for her wedding (and I’m trying not to do the same thing as her). And then I stumbled upon this post during a jaunt over at Offbeat Bride. Mr Big and I are perpetual high-fivers. The first thing we do when either of us has succeeded in something, be it in my academic work or Mr Big’s job, we high-five each other. The same applies to others. For example, my little sister/junior bridesmaid/Groom’s Homie got a good mark in her exams, she gets a high-five; my older sister and maid-of-honour got a job, she gets a high-five, etc. Image via Offbeat Bride, photography by Kate Crafton. I suggested the idea to Mr Big and he was so there. We think it’s an awesome example of us as a couple. We’re constantly high-fiving each other and everyone else. What’s even more is, when others found out they were all for it. We even got one of Mr Big’s groomsmen giving us a thumbs-up for it. What this means, however, is that the send-off will have to happen indoors. Guests will have to line up, similar to the “archway” where guests form an arch with their arms. Instead of holding hands above and running underneath them, which will be extremely difficult for my 6’0″ husband-to-be, they’ll put their arm up, palm facing towards us. 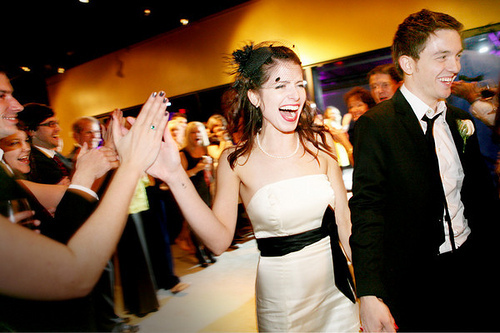 We then run through them, high-fiving each and every one of our guests! Unfortunately, it’ll be MUCH too long to say it all in one post. So I’ll start with a more recent disappointment. Our reception space cannot do a sparkler exit. But… we can’t have pictures like that… because our reception space doesn’t allow it. For good reason too, the last time they did a sparkler exit, the guests left the sparklers lying around everywhere, charred the wooden deck, and made a general mess of things. It is because of that wedding that all other wedding have promptly suffered. 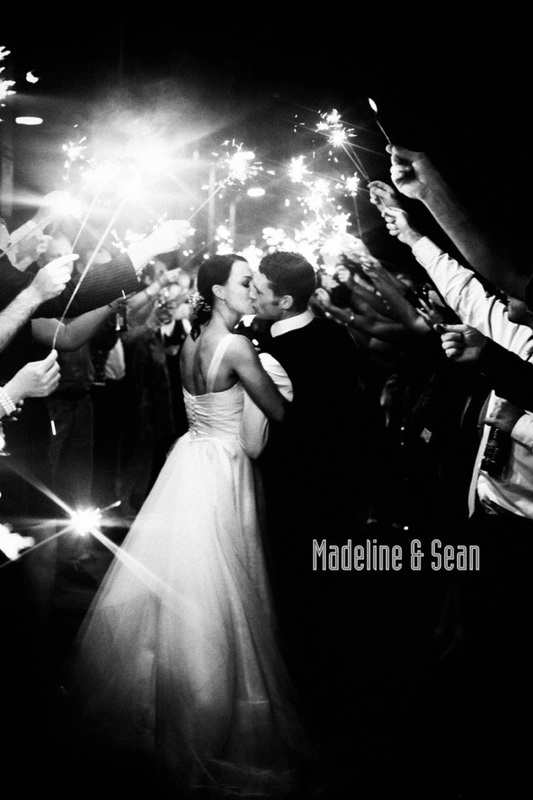 I’ve had ideas, but GP didn’t really like them – glow stick exit doesn’t match our general wedding ‘theme’, bubbles don’t photograph well at night, confetti is usually out of the question because of the mess factor (and I don’t really like confetti). The reception space usually has a goodbye circle or an archway, but a goodbye circle involves the bride and groom saying goodbye to EVERYONE (and we have over 100 guests) and the archway was used by my cousin for her wedding (and I’m trying not to do the same thing as her). So what do we do!? Anyone have any ideas?